“My grandmother was a professional illustrator. Her maiden name was Melanie Elisabeth Norton (1868-1933) and this was the name she customarily used for her professional work. 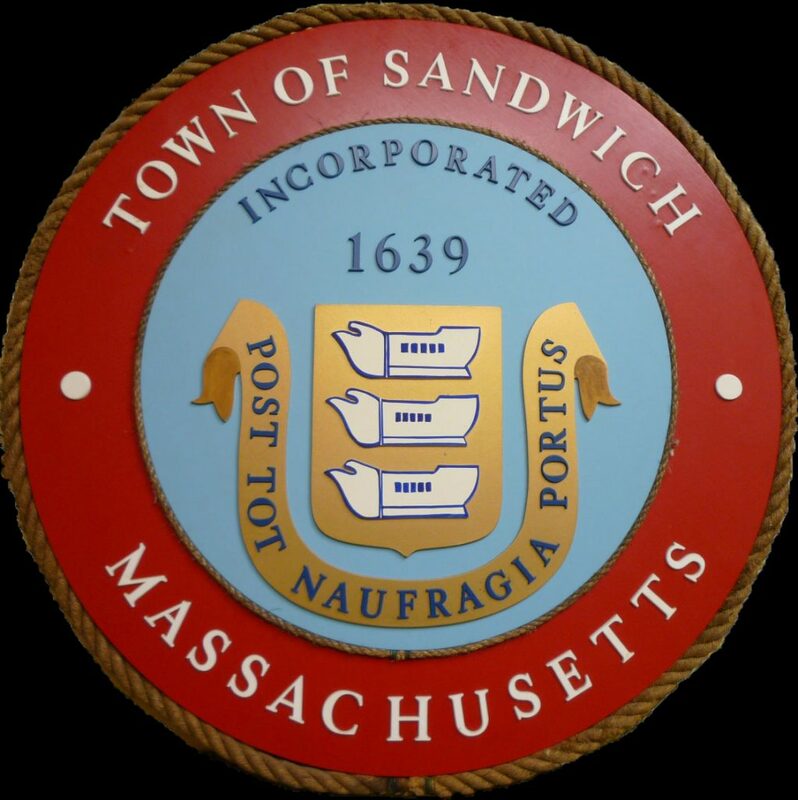 She conceived and drew the Town Seal of Sandwich, Massachusetts which she completed in 1901 [or possibly it was adopted by the Selectmen in 1901]. According to her son, Jonathan Norton Leonard, Science Editor of Time Magazine, in his 7 August 1971 letter to Channing Hoxie, Town Clerk of Sandwich, MA, ‘She was planning a trip to England so the Selectmen asked her to go to the old Town of Sandwich in Kent [England] to see if it had a seal that could be adapted for our use.’ Melanie Elisabeth Norton utilized the three ships on seal of the Town of Sandwich England substituting on the prow of each ship the head of American eagle for the British lion. 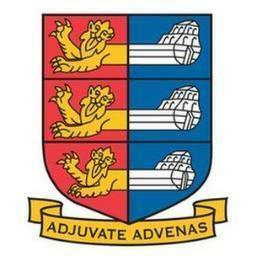 “The rope & wood Town Seal (shown above) has charm, but it is NOT an accurate depiction of the Town Seal as completed and adopted. The most glaring feature is the prows of the three ships. Melanie Elisabeth Norton replaced the British lions with American eagles, displaying the eye, beak and head of the American eagle. The rope & wood version of the eagles is incomprehensible and it is impossible even to guess what it represents. Scan of jacket cover from the Lovell book. 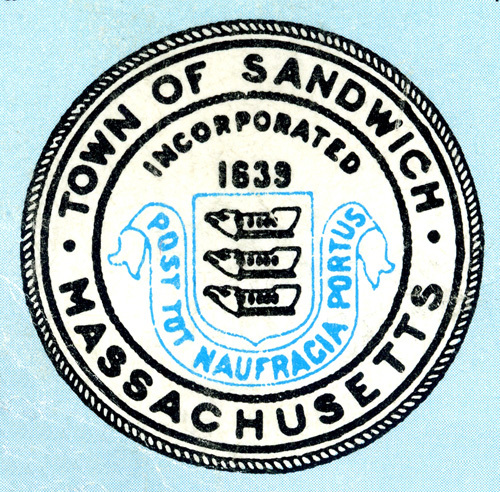 “The most accurate copy of the original adopted by the Selectmen that I am aware of appears on the paper jacket cover of R. A. Lovell’s history of Sandwich: Sandwich, A Cape Cod Town [1996 edition]. Though the image is only about an inch across, it is possible to just see the beak and eye of each eagle. John William Montague (1718-1792), was the 4th Earl of Sandwich. It is said that we get the name of the “sandwich” we eat from the 4th Earl. Legend has it that Montague was a hardened gambler and usually gambled for hours at a time at a restaurant, sometimes refusing to get up even for meals. He ordered his valet to bring him meat tucked between two pieces of bread so he didn’t need to bother with utensils to eat it. Because Montague was also known as the Earl of Sandwich, others began to order “the same as Sandwich!” And the name stuck. This entry was posted in Articles, History of Sandwich, Sandwich UK. Bookmark the permalink.